Meliza Bañales is Hitting the Road! 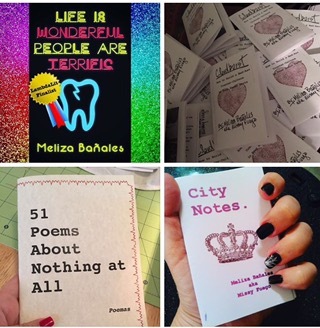 Meliza Bañales is on tour NOW, in support of her novel Life is Wonderful, People Are Terrific making it to the finals of the Lambda Literary Awards! Check out the dates below and head out to support a major talent and force of literary magic. The Forest 5551 Atlantic Ave.
Noon-5pm: Tabling and book signing by 2016 Lambda Literary Finalist Meliza Bañales and her press, Chulx Press! Stay 5pm-9pm for all the Queer punk bands and big gay dance after-party! *Books and zines will be for sale. FEATURE at Thursday Night Open Mic, Hosted by Ventura Poet Laureate, Phil Taggert! CO-FEATURE with fellow 2016 Lambda Literary Finalist for Transgender Non-Fiction, Willy Wilkinson (author of “On the Edge of Race and Gender”)! Con Fuerza Collective and Chulita Vinyl Club LA Chapter Present: Womxn of Our Lives Open Mic! Sign-Up at 7pm, list priority goes to WOC, QWOC, QPOC, gender-fluid, and Trans folks!